GEORGE WASHINGTON. Autograph Manuscript, Pages 27-28, 35-36, and 47-48 of Washington’s own draft of his undelivered inaugural address. [written ca. January 1789]. 6 pp. on 3 leaves, 7 x 9 in. Although the agency I had in forming this system, and the high opinion I entertained of my Colleagues for their ability & integrity may have tended to warp my judgment in its favour....[it is my] fixed belief that this Constitution, is really in its formation a government of the people; that is to say, a government in which all power is derived from, and at stated periods reverts to them--and that, in its operation, it is purely, a government of Laws made & executed by the fair substitutes of the people alone. The election of the differt branches of Congress by the Freemen, either directly or indirectly is the pivot on which turns the first wheel of the government--a wheel which communicates motion to all the rest. In short, Washington’s undelivered inaugural address is his clearest statement on how he envisioned the nation, and these three leaves are among the most substantial of the entire speech. Only 13 complete leaves of the 37 leaf (73-page) original manuscript are known to have survived, along with some fragments of pages as small as a couple of lines. Seven of those leaves are already in institutional collections: the Gilder Lehrman Collection on deposit at the New-York Historical Society has three, Princeton University has two, the Pierpont Morgan Library has one, and Massachusetts Historical Society has one. In private hands, only three other leaves are known, all owned by separate collectors. George Washington only reluctantly accepted the office of president. At that moment in his life, all he wanted to do was to play the role of a gentleman farmer. He had already achieved independence for his country on the battlefield, and then he returned to solve the political crisis that resulted in the federal Constitution. Now, he was being tasked for a third time, and Washington knew better than anyone the perils the job would entail. Much like the War, there was no guarantee of success, and much work to be done. The Constitution had only provided the barest framework of government, and executive agencies, legislative rules, and the entire federal judiciary still needed to be fleshed out. On top of that, there was already talk of amending the Constitution, and two states, North Carolina and Rhode Island, had not yet ratified the original document. By the time Congress announced the official results of the first U.S. presidential election in April of 1789, Washington had long accepted the fact that he would be called to take the helm. It was an unwelcome prospect for the retired leader, who would describe his feelings on taking office as “not unlike those of a culprit who is going to the place of his execution.” In January 1789, Washington sent a lengthy draft of his proposed inaugural address to James Madison for review. Madison set the draft aside and completely rewrote the speech. It was Madison’s version that Washington delivered on April 30, 1789, to a joint session of Congress. 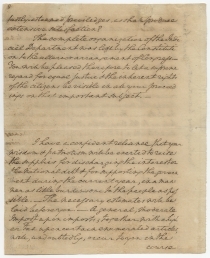 In 1827, when Jared Sparks was at Mount Vernon collecting manuscripts for his edition of Washington’s writings, he came across the January 1789 letter in which Washington asked Madison to review a draft of his proposed inaugural address. Along with the letter, Sparks found a copy of the address in Washington’s hand. [T]here is preserved with [the letter] the copy of a message, or as he calls it, a speech, in his own hand, which I presume is the same that was sent to you for your revision, according to the request in his letter. The Speech…extends to seventy three pages, in which is included a short space for a prayer, that was to be introduced after the first paragraph…. Sparks indicated to Madison that he supposed David Humphreys was the author of the draft address. 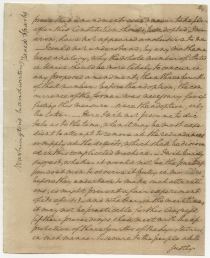 Noting that “no part of it seems to have been formally introduced in the real message,” Sparks observed that it was “an extraordinary production for a message to Congress, and it is happy, that Washington took counsel of his own understanding, and of his other friends, before he made use of this document.” Madison, proud of his role in writing the shorter address that Washington actually delivered, reportedly believed the lengthy draft to be radical and inferior. He readily accepted the idea that Humphreys, a historian, poet, and Washington aide, was the real author. Sparks neither transcribed nor kept copies of it, and he did not include it in The Complete Writings of George Washington,first published in 1839. Over time, Sparks broke up Washington’s manuscript and gave away leaves in response to requests “for something written by Washington.” As he received more requests, Sparks began to cut it up further, giving away fragments of pages. For many decades, recipients knew they had a Washington manuscript, but the connection to the inaugural address was lost. Historians, unable to re-assemble the text, largely accepted Sparks’s attribution to Humphreys. However, we believe that the weight of evidence shows that Washington played a central role in the writing of this draft inaugural, and that it represents one of the most comprehensive and true pictures of Washington’s political thoughts and hopes as he was about to take the helm of the new Federal government. Two major points of physical evidence support Washington’s authorship. The first is the original manuscript, or at least its surviving parts, which are indisputably in his hand. It is entirely unlikely that Washington himself would have taken the time to copy 70-plus pages authored by someone else; that alone is a strong indication that he is the author or at the very least played a significant role in the authorship. 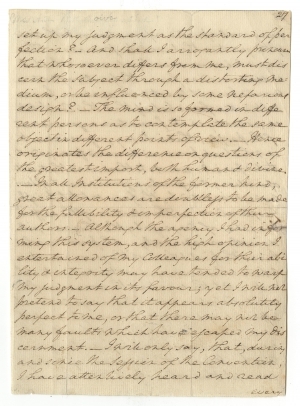 Humphreys was likely instructed to make a fair copy of the address, which was sent to Madison while Washington kept his original. The second piece of evidence is found in Washington’s letter transmitting a copy of the draft to Madison for his advice. Washington wrote that the author of the manuscript was “a gentleman under this roof.” This comment has been repeated with the unexamined assumption that Washington is here crediting Humphreys with authorship. However, without Sparks’ presumption coloring the discussion, we can suggest an equally plausible explanation. Washington’s phrasing, while scrupulously true, was a clever way to deflect any concern Madison might have had about responding too forcefully. By creating the impression that someone else (Humphreys) had written it, Washington gave Madison latitude to be as critical as necessary. Considering Madison’s ultimate rejection and replacement of the whole draft address, if this was Washington’s intent, it certainly worked. Would Madison have been so bold as to rewrite an entire speech by General (and soon to be president) Washington? The speech that was given was truly more appropriate for the time, but the draft is actually a more detailed, nuanced, and complete picture of Washington’s thoughts for the new government that he was about to lead. Another important piece of evidence has been used to bolster the attribution to David Humphreys. A few months later, Humphreys gave a Fourth of July oration before the Connecticut branch of the Society of the Cincinnati. Many of the passages we have in Washington’s hand were used by Humphrey’s, though edited for third-person speaking; in fact, most of Humphrey’s address was derived from the draft inaugural address. (Humphreys almost certainly obtained Washington’s approval to do so.) According to scholar W.B. Allen, “The editing to which he subjected it, however, suggests that the original could not have reflected his work alone, thereby bolstering our confidence that the “discarded inaugural” reflects Washington’s own thoughts.” Frankly, though Humphreys was well-known as an author and poet, and certainly well-schooled in Federalist political thought, judging from Washington’s letters written about the need to bolster American’s government during the Revolution (and even more so in the immediate aftermath of the Constitutional Convention during the process of ratification), his writing better stands the test of time. At the time the draft address was written in late 1788 or early 1789, Humphreys was in residence at Mount Vernon pouring through Washington’s papers to complete his biography of the great man. 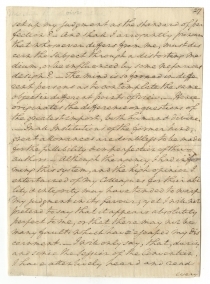 The surviving portion of his notes addressing Washington’s election to the presidency “contains direct quotes and paraphrases of private conversations” between the two men. By that time, Washington had already reviewed the first portion of Humphreys’s biography and submitted a manuscript list of notes and corrections which Humphreys subsequently incorporated. The working relationship between the two was cordial and collaborative. 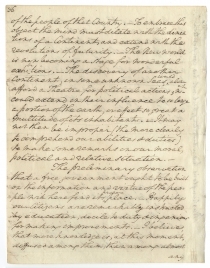 Though Humphreys clearly contributed to drafting the address, what survives of the manuscript, Allen argues, makes “a manifest contribution to our knowledge of how far Washington’s understanding, as opposed to his image, contributed to the founding of the United States.” Rather than criticizing the text, Allen writes that if it could be completely re-assembled, it would provide “a comprehensive statement of his [Washington’s] political understanding.” We agree. 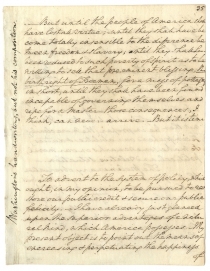 By gathering these three leaves, and making preliminary inquiries about the possibility of arranging loans of the majority of the other known leaves, we look forward to the opportunity to show as much of Washington’s draft of his first inaugural address to the public as possible sometime before its 230th anniversary in 2019. Pages 27-28 and 47-48: Bushrod Washington – Jared Sparks – Frederick S. Peck (Samuel T. Freeman & Co, February 17, 1947, lot 186, part (with 57-62) – Forrest G. Sweet (Parke-Bernet, May 8, 1957, part of lot 370, with 19-20 and 57-62) – Nathaniel E. Stein (Sotheby Parke Bernet, January 30, 1979, lot 183 and 187) – Fred Nederlander – the present owner. Pages 35-36: Bushrod Washington – Jared Sparks – Mary Lyell (Phillips, 13 June 1996, lot 225) – private collector (Christie’s, 13 November 2011, lot 204) – the present owner. The sentence concluded on page 47 begins on a fragment of page 46 (last recorded in 1958 as in private hands). Washington to Henry Knox, April 1, 1789 (GLC02437.09419, The Gilder Lehrman Collection on Deposit at New-York Historical Society). 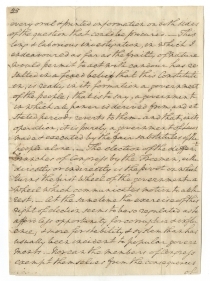 Sparks to Madison, May 22, 1827 (James Madison Papers at the Library of Congress).